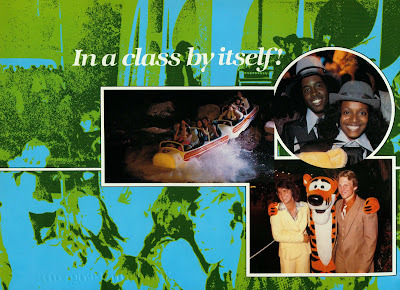 Well, we made it, the last Grad Nite post... Don't fear, I actually have tons MORE Grad Nite stuff, so all things equal, check back next June for a whole news series, plus some of the "best of" from this series. 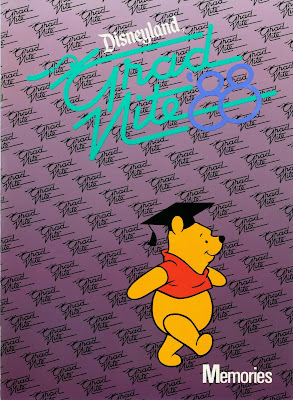 Grand Nite '88 had a Winnie the Pooh theme, kind of Kiddie-like, but I suppose the Grads are just a bunch of big kids. This is the LAST time I will tell you this; Hold Your Own Ticket! 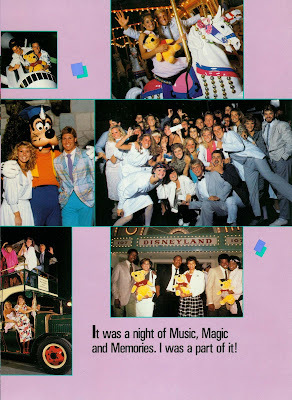 "Gate Flyer" showing the show times for the evening of June 23, 1988. 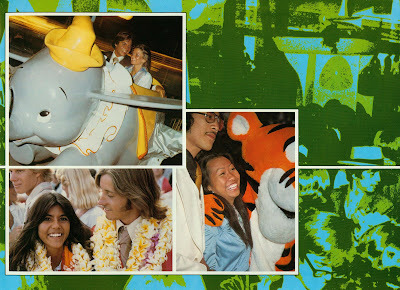 The program, lots of fun photos. Massive confession; see the group shot in the middle, the guy to the far right in the striped grey jacket and dark grey tie (and beard) is a dead ringer for me. 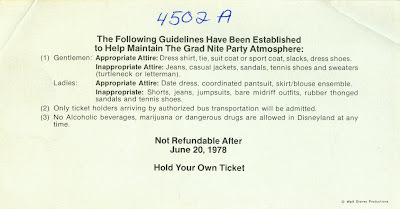 No I wasn't there, I graduated 5 years earlier, BUT I had that exact jacket, tie, pants, hair style and attitude. 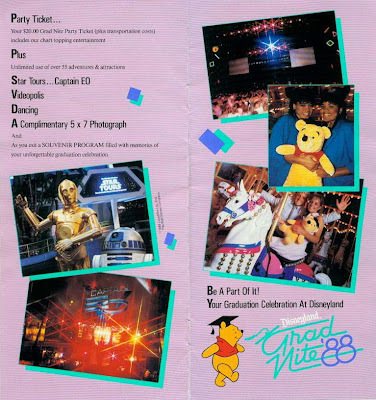 This brochure was for students to sign up for grad nite. 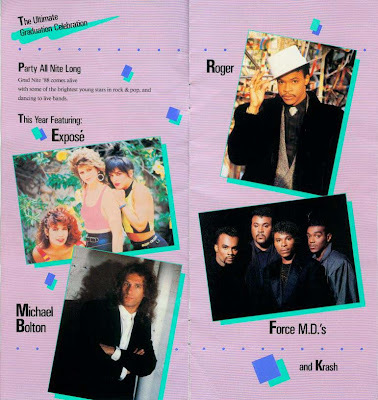 Notice Michael Bolton was scheduled to appear. 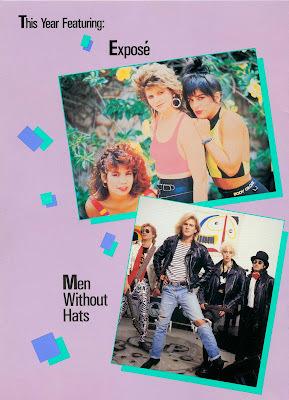 But according to the program above, he was replaced with "Men without Hats". Two questions; Who dropped who? 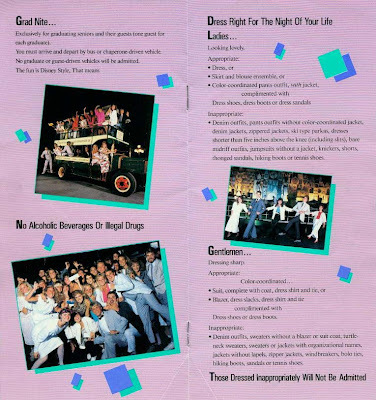 And did we get a better deal with the "Safety Dance" crew? Grad Nites are over, the fun has ended, now on with the Summer! 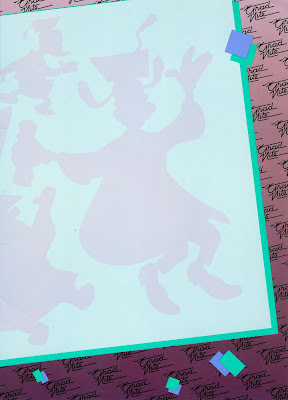 Today's Bonus Sunday consists of two "Disneyland Lines" these are weekly publications of the Disney University. These are actually the only two I have, but I am getting copies of some from various sources, so expect to see more in the future. 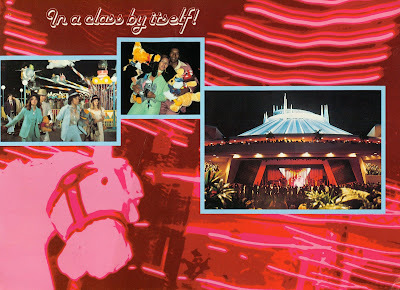 Up first from Wednesday's Grad Nite '78 post (link) here is the Disneyland Line Matterhorn Special Edition. 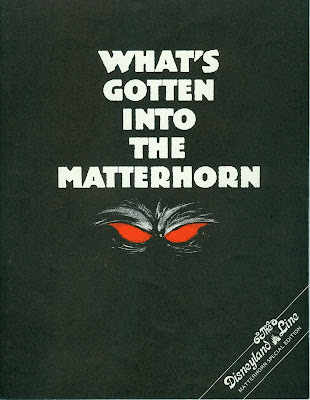 Lots of great stuff about the Matterhorn upgrade, I didn't realize how extensive the update was. 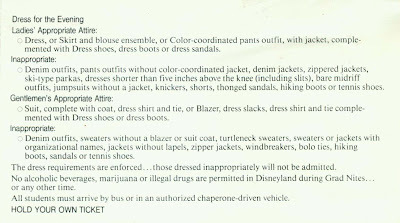 Tomorrow: Grad Nite, again???? 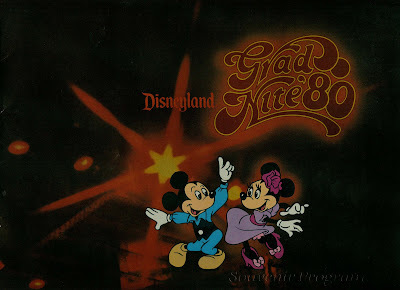 It's still June, so yes, one more Grad Nite! 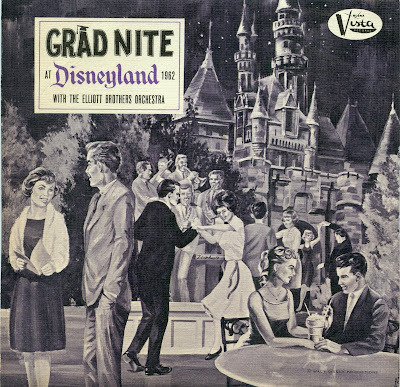 Buena Vista Records proudly presents “Grad Nite at Disneyland 1962 with the Elliott Brothers Orchestra”. 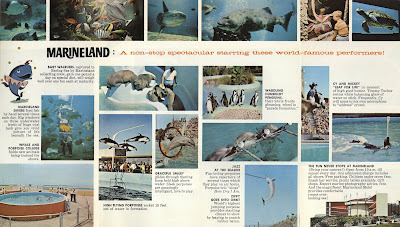 1962 Grad’s are having a blast on the cover. 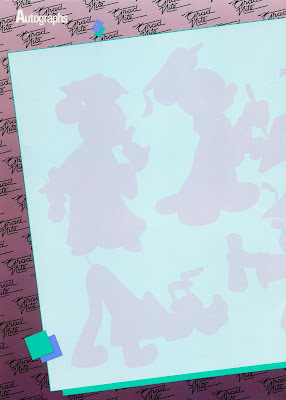 The paper sleeve has that fun textured feel like an oil painting on canvas. 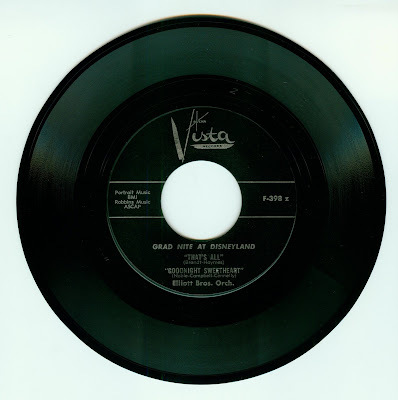 The songs for the 45rpm record were “extracted” from “Date Nite at Disneyland with the Elliott Brothers”. 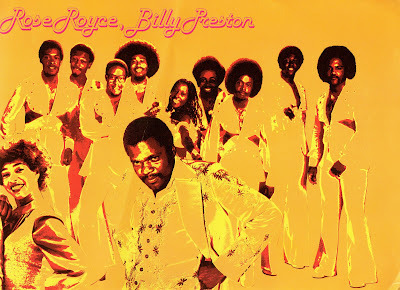 The 45 has a black label on a black record, so the scan came out so-so. 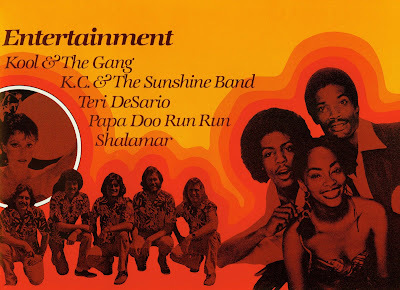 Two parts for your listening pleasure today. 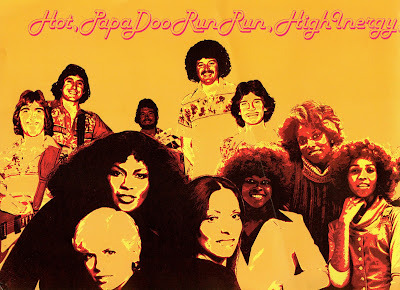 First, “That’s All” This recording on my digital camera does not do the audio justice, the bass is rather deep and the overall fidelity is remarkably good for a 46 year old record. 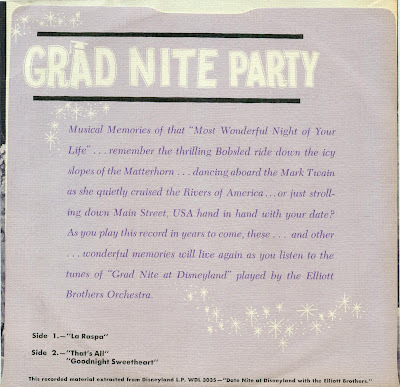 Second up is “Goodnight Sweetheart” this is neat because at the end one of the Elliott Brothers introduces the band members and thanks everyone for being at Disneyland, fun stuff. 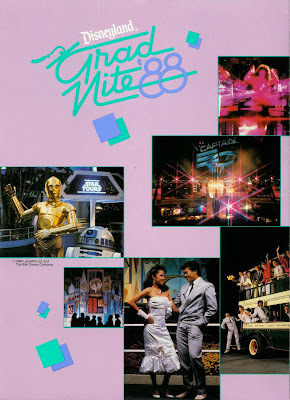 Welcome to Grad Nite ’80! No tickets today, just the program. 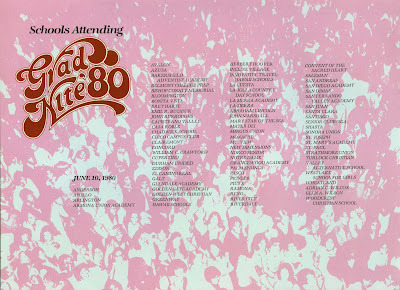 Once again, short on text, so enjoy June 10, 1980. 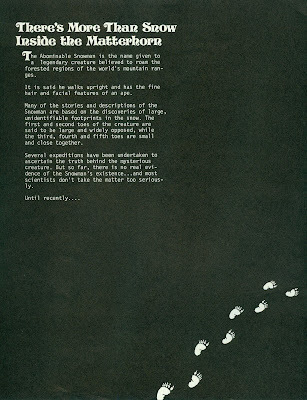 These last two pages are odd looking on purpose, no scanner error, just a odd sense of art direction. 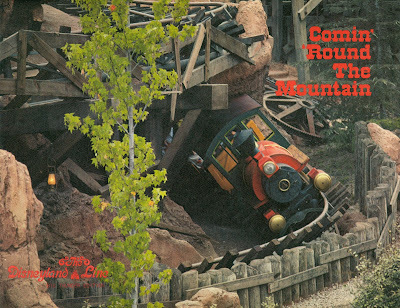 Here’s a much clearer picture of the New Big Thunder Mountain Railroad. 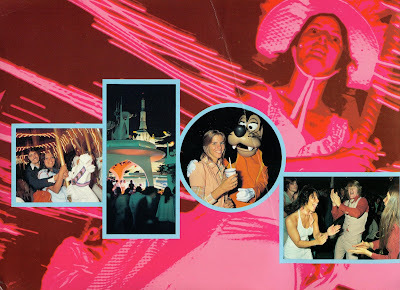 This is from the cover of a 1979 Disneyland Line. Want to see the whole issue? Yup, come back on Bonus Sunday, its a fun one too. 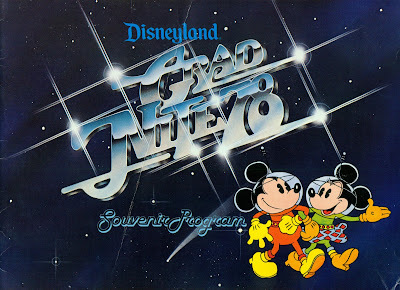 Tomorrow; Souvenir Saturday brings us MORE Grad Nite stuff, this time its audio visual fun. 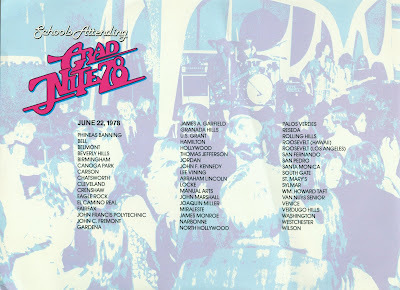 It’s Grad Nite ’78 (so much for my attempt to post these chronologically!). 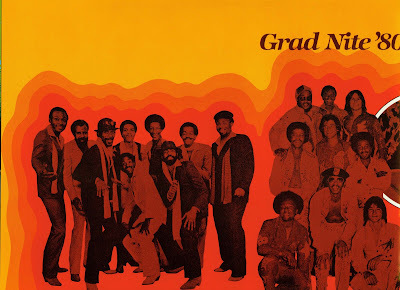 I hope you're still up for a few more Grad Nites, however as all Grad Nites do, this series will be over by the end of June. 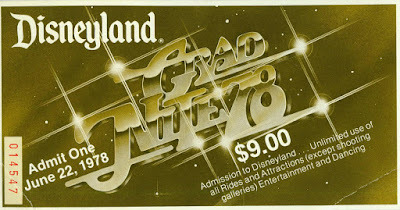 This ticket has no colors, but still looks fun, admit one on June 22, 1978. 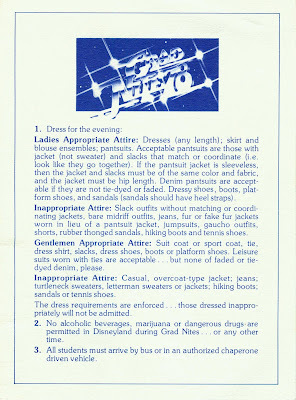 Typical stuff on the back and don’t make me tell you again to “Hold your own ticket”! 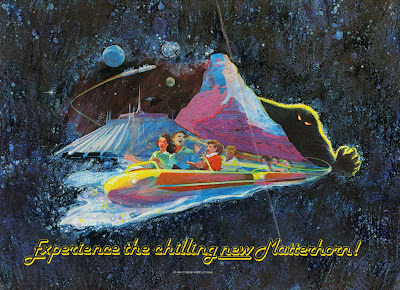 These lucky grads got to “Experience the chilling New Matterhorn.” Neat simple graphics sometimes make a bold statement. 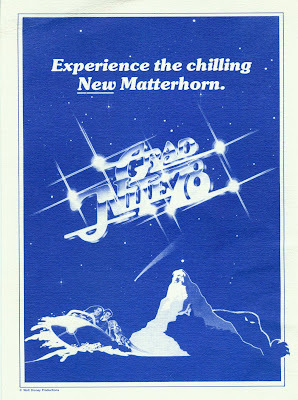 The program has some super late 70’s (not so simple) graphics; I like the shinny chrome lettering. Mickey and Minnie almost look retro, aren’t they cute? 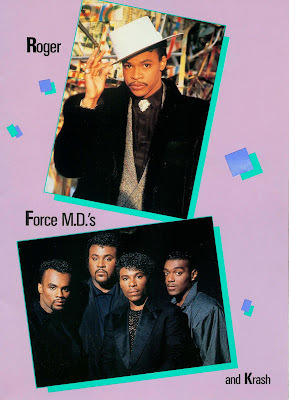 These two pages are supposed to look like this, I’m not sure what mood they were aiming for, but I think they missed it… I’ve also seen better entertainment line ups. Is your high school on there? MINE IS! El Camino Real, a dead ringer for “Clueless”, it was just a giant social club of which I could only dream of my imminent escape. My only fond memories are the fact that the entire school was air conditioned and was an “open” campus so I could leave for lunch and never come back! 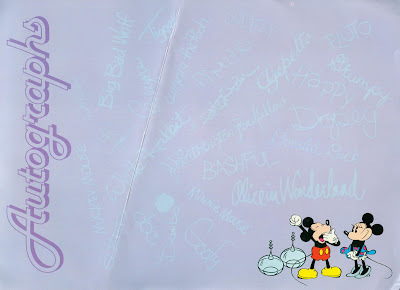 The back cover art work is fun, too bad it’s got a big fold in it. 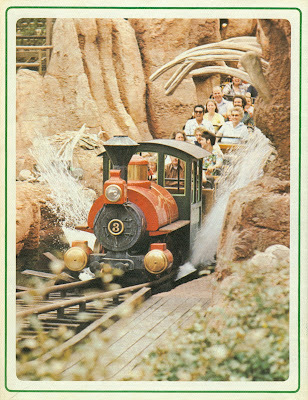 And since these grads got to see the New Matterhorn, I guess they got an answer to the question on the cover of this 1978 Special Edition of the Disneyland Line. Come back on Bonus Sunday for a scan of the entire issue, it’s a fun one. 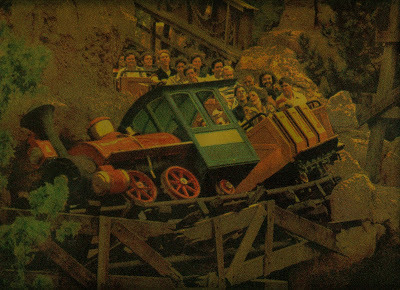 Tomorrow: More Grad Nite? 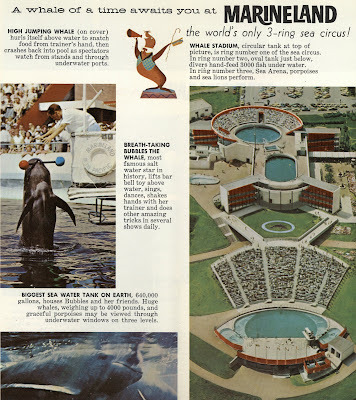 Nah, we’ll take a little break and head down to Palos Verdes to cool off by the ocean, in 1962. 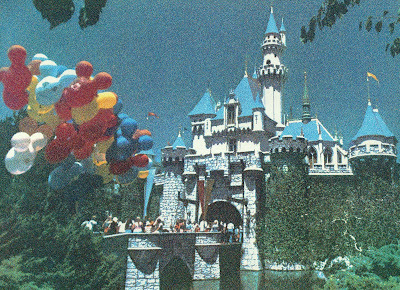 Fortnight - August 1955 "Chaos in Disneyland"